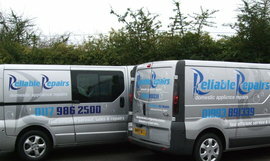 Reliable Repairs.....the clue is in the name. Washing machines, dishwashers, cookers, ovens, tumble dryers, Witney, Keynsham, Carterton, Bath, Chipping Norton, Kidlington and all surrounding areas. Reliable Repairs established in Stonesfield at the start of the new millennium - with a name we constantly live up to! Our engineers have in excess of thirty years experience and carry a comprehensive range of spare parts ensuring that we consistently complete repairs with just one visit. If your appliance should be beyond economical repair we can often supply and install a brand new replacement the same day! We can always beat internet appliance sellers for service and pretty much every time beat them on price too. Our recycling ethos is second to none...If we supply and fit a new part we will always, where possible, recycle not only the packaging from the new part we fit but also the old part itself. Should you decide to purchase your new appliance from Reliable Repairs, whether you are in Witney, Carterton or any where else, we will always recycle the old appliance and ALL of the packaging, that includes the normal cardboard but also the plastic AND POLYSTYRENE - we are committed to our environment.